Optimal Ag targeting and activation of APCs, especially dendritic cells (DCs), are important in vaccine development. In this study, we report the effects of different Toll-like receptor (TLR)-binding compounds to enhance immune responses induced by human APCs, including CD123+ plasmacytoid DCs (PDCs), CD11c+ myeloid DCs (MDCs), monocytes, and B cells. PDCs, which express TLR7 and TLR9, responded to imidazoquinolines (imiquimod and R-848) and to CpG oligodeoxynucleotides stimulation, resulting in enhancement in expression of costimulatory molecules and induction of IFN-α and IL-12p70. In contrast, MDCs, which express TLR3, TLR4, and TLR7, responded to poly(I:C), LPS, and imidazoquinolines with phenotypic maturation and high production of IL-12 p70 without producing detectable IFN-α. Optimally TLR ligand-stimulated PDCs or MDCs exposed to CMV or HIV-1 Ags enhanced autologous CMV- and HIV-1-specific memory T cell responses as measured by effector cytokine production compared with TLR ligand-activated monocytes and B cells or unstimulated PDCs and MDCs. Together, these data show that targeting specific DC subsets using TLR ligands can enhance their ability to activate virus-specific T cells, providing information for the rational design of TLR ligands as adjuvants for vaccines or immune modulating therapy. Professional APCs recognize and capture invading pathogens leading to appropriate induction of Ag-specific T cell responses. The ability of APCs to induce CD4+ T cell polarization into Th1 or Th2 responses is strongly influenced by the specific type of APC, the type of stimulation, and ultimately the cytokines produced from such cells. In this regard, APC function and its ability to direct Th cell differentiation may be mediated through interactions with Toll-like receptors (TLRs) 3 expressed on the APCs (1). Thus, interest in compounds that bind to TLRs has recently intensified, as they may serve as potent vaccine adjuvants directly targeting and activating APCs. The human immune system contains different types of APCs, including monocytes/macrophages, B cells, and two distinct subsets of dendritic cells (DCs): CD123+ plasmacytoid DCs (PDCs) and CD11c+ myeloid DCs (MDCs) (2, 3). DCs, monocytes, and B cells exhibit distinct expression patterns of TLRs, and therefore may be equipped to confront different pathogens and dictate different immune defenses accordingly (4, 5). At present, several ligands for distinct TLRs have been identified. LPS binds to a complex of molecules, including TLR4, which is expressed on monocytes and MDCs (4, 5, 6). Furthermore, TLR3, which is required for responsiveness to dsRNA, may be expressed to different levels on monocytes, MDCs, and B cells (4, 7, 8, 9, 10). Among human APCs, only PDCs and B cells have been demonstrated to express TLR9, which recognizes unmethylated bacterial DNA with immunostimulatory CG motifs, known as CpG oligodeoxynucleotides (ODN) (9, 11, 12). It was recently reported that the low m.w. imidazoquinoline compounds, imiquimod and R-848 (resiquimod), activate human APCs via TLR7 and TLR8 (12, 13, 14). TLR7 may be expressed on all subpopulations of APCs to various degrees (6, 12). Previous reports have shown that APCs have a distinct response pattern of phenotypic differentiation and cytokine production in response to different TLR ligands corresponding to their expression of TLRs (5, 9, 12). Whereas many prior studies focused on specific TLR ligands interacting with certain APCs, there has not been a systematic evaluation comparing several different TLR ligands for their ability to functionally alter distinct subsets of human DCs, B cells, and monocytes. In this study, we investigated the ability of human APC subsets, exposed to several different compounds using different TLRs, to stimulate virus-specific T cells. We show that CMV-and HIV-1-specific CD4+ and CD8+ T cell responses can be enhanced by the respective subsets of DCs stimulated by the appropriate TLR ligands. Therefore, TLR ligands that specifically activate both PDCs and MDCs may serve as optimal human vaccine adjuvants or modulators of pre-existing memory responses. This study was approved by the National Institutes of Health Institutional Review Board. PBMC were collected from healthy normal blood donors by automated leukapheresis. Enriched populations of lymphocytes and monocytes were obtained by counterflow centrifugal elutriation. High yields (1–15 × 106) of MDCs and PDCs were isolated from 0.5 to 1.5 × 109 elutriated monocytes using a combination of magnetic bead isolation and FACS sorting. The monocytes were incubated with anti-CD3 FITC, CD14 FITC, CD15 FITC, CD19 FITC, and CD56 FITC (BD Biosciences, San Jose, CA), and subsequently incubated with anti-FITC microbeads (Miltenyi Biotec, Auburn, CA). The cells were separated using AutoMacs (Miltenyi Biotec). The unlabeled cell portion was again stained with the lineage markers anti-CD3 FITC, CD14 FITC, CD15 FITC, CD19 FITC, and CD56 FITC, in addition to anti-CD11c APC, CD123 PE (BD Biosciences), and HLA-DR Cascade Blue. Purified anti-HLA-DR was obtained from BD PharMingen (San Diego, CA) and conjugated with Cascade Blue (Molecular Probes, Eugene, Oregon) in our laboratory using a standard protocol (http://drmr.com/abcon). The labeled cells were then sorted on a modified FACSVantage SE/DiVa (BD Biosciences) by gating on the CD123+ PDCs and CD11c+ MDCs within the HLA-DR+lineage marker− population. This isolation procedure resulted in >98% pure populations of DCs. For some experiments, DC isolation kits (Miltenyi Biotec) followed by sequential separation on AutoMacs were used for purification of DCs from elutriated monocytes. The BDCA-4 isolation kit, which was used for isolation of PDCs, achieved >80% pure populations, and the CD1c isolation kit for isolation of MDCs resulted in >90% purity. The contaminating cells were monocytes. To maintain viability, the PDCs and MDCs were cultured in the presence of IL-3 (1 ng/ml; R&D Systems, Minneapolis, MN) and GM-CSF (2 ng/ml; PeproTech, Rocky Hill, NJ), respectively. CD14 and CD19 expression was used for isolation of monocytes from elutriated monocytes and B cells from elutriated lymphocytes, respectively. Purity was >97%. Enriched populations of negatively selected CD4+ and CD8+ T cells, depleted of CD14+, CD15+, CD19+, and CD56+ cells, were isolated using microbeads (Miltenyi Biotec) on elutriated lymphocytes. Purity was >96%. Two distinct classes of immunostimulatory CpG ODN have been identified for activation of human PBMC (15, 16). The class “A” (or “D”) type of CpG ODNs has a mixed phosphodiester/phosphorothioate backbone and contains a single hexameric purine/pyrimidine/CG/purine/pyrimidine motif flanked by self-complementary bases that form a stem-loop structure capped at the 3′ end by a poly G tail. Class “B” (or “K”) has a phosphorothioate backbone encoding multiple TCGTT and/or TCGTA motifs. In this study, we used a CpG ODN hybrid named class C 2395 designed to exhibit stimulatory properties of both class A and B. This CpG ODN 2395 consists of a hexameric CpG motif, 5′-TCGTCGTTTT-3′, linked by a T spacer to the GC-rich palindrome sequence 5′-CGGCGCGCGCCG-3′ (17). A control CpG ODN without stimulatory sequences was simultaneously tested in each experiment. The CpG ODNs were used at 4 μg/ml and purchased from Coley Pharmaceutical Group (Ottawa, Canada). The APCs were also stimulated with either LPS (Sigma-Aldrich, St. Louis, MO) at 100 ng/ml or dsRNA complex polyinosinic:polycytidylic acid poly(I:C), (Sigma-Aldrich) at 50 ng/ml. The imidazoquinolines, imiquimod (1-(2-methylpropyl)-1 H-imidazo[4,5-c] quinolin-4-amine; Sequoia Research Products, Oxford, U.K.) or R-848 (4-amino-2-ethoxymethyl-α, α-dimethyl-1H-imidazoquinoline-1-ethanol; GLSynthesis, Worcester, MA) were also used for stimulation of APCs at 0.25 μg/ml (8 × 10−8 M) and at 1 μg/ml (2.8 × 10−7 M), respectively. All TLR ligands were tested at a range of different concentrations in initial experiments and subsequently used at a concentration that caused significant DC phenotypic differentiation without increased cell death in any of the APC cultures (data not shown). It should be noted that in the initial dose response experiments, high doses of the imidazoquinolines were toxic to monocytes, whereas PDCs, MDCs, and B cells still showed phenotypic differentiation and no increased cell death. Thus, to stimulate the different APCs in a similar manner, a dose that was not toxic to the monocytes was used. The contaminating endotoxin levels were <0.1 ng/ml in all TLR ligands (except LPS) as assessed by Endotoxin kit (Seikagaku America, Falmouth, MA). The different freshly isolated APC populations were cultured at 1 × 106 cells/ml for indicated time periods at 37°C in polystyrene round-bottom tubes in RPMI medium (BioWhittaker, Walkersville, MD) supplemented with 10% FCS and antibiotics in the presence or absence of the indicated TLR ligands. Cells were harvested, washed in PBS supplemented with 0.5% BSA, and stained. Abs used for phenotypic analysis were combinations of anti-CD11c, anti-CD123, anti-CD14, anti-CD20, anti-CD40, anti-CD80, anti-CD86, anti-HLA-DR, and anti-CD83. Nonspecific Ab binding was examined by staining the cells with fluorochrome-labeled isotype-matched normal mouse Igs. The cells were analyzed by a FACSCalibur flow cytometer (BD Biosciences). Cell viability was evaluated by propidium iodide staining. Some of the Abs were conjugated with Cy5PE, Cy7PE, or Cy7APC made in our laboratory according to procedures published (http://drmr.com/abcom). This enabled combinations for polychromatic flow cytometry analysis of up to 14 parameters simultaneously on a modified FACSVantage SE/DiVa (http://drmr.com/abcon) (18). Cytokine release after exposing the various APC populations to different stimuli was studied by culturing the APCs at 1 × 106 cells/ml for 24 h at 37°C in polystyrene round-bottom tubes in the presence or absence of the indicated stimuli. The supernatants were harvested and analyzed. ELISA kits for IFN-α (detection limit 12.5 pg/ml) and IL-12 p70 (detection limit 1.56 pg/ml) were purchased from BioSource International, (Camarillo, CA). All supernatants were analyzed in duplicate by ELISA performed according to the manufacturer’s instructions. Whole CMV Ag preparations were derived from the CMV AD-169 virus strain grown in MRC-5 cells and inactivated by irradiation (Microbix Biosystems, Toronto, Canada). Supernatants processed similarly from uninfected MRC-5 cells served as control for the CMV preparations (Microbix Biosystems). Recombinant CMV pp65 protein (Research Diagnostic, Flanders, NJ) was used in comparable experiments. Freshly isolated APCs obtained from CMV seropositive healthy blood donors were stimulated with CMV Ag or control supernatant for 1–12 h before addition of indicated TLR ligands for additional incubation for 12–24 h. Purified autologous T cells were added to the APC cultures at a ratio of 1 APC per 10 T cells, and incubated for 2–4 h at 37°C in a 5% CO2 incubator, followed by an additional 4 h in the presence of the secretion inhibitor brefeldin A (10 μg/ml; Sigma-Aldrich). The analysis of the T cell responses was performed by detection of intracellular cytokine production revealed by flow cytometry as described earlier (19, 20). Briefly, the cells were washed and surface stained for 20 min at 4°C with Abs to CD3, CD4, and CD8, and thereafter washed, fixed, and permeabilized for 10 min using a 2× fixation-permeabilization solution (BD Immunocytometry Systems, San Jose, CA). The cells were washed twice and stained intracellularly with IFN-γ- (BD PharMingen), TNF-α- (BD PharMingen), and IL-2- (Caltag Laboratories, Burlingame, CA) specific Abs. The cells were analyzed on a FACSCalibur flow cytometer. APCs isolated from HLA-A2+ CMV seropositive healthy blood donors were stimulated with TLR ligands for 12–24 h. An HLA A2-restricted CMV pp65 (amino acid sequence NLVPMVATV) was thereafter allowed to bind to the cells for 1 h and was then washed out before autologous T cells were added at an APC:T cell ratio of 1:10. The APC-T cell cocultures were incubated for another 6–8 h as described above. The cells were washed and stained with MHC class I-restricted tetramer complexes containing the HLA A2-restricted peptide (pp65495–503) (Beckman Coulter, Miami, FL) for 20 min at 37°C, and the subsequent addition of Abs to CD3 and CD8 for 15 min at 4°C (19, 20). The cells were then fixed, stained for intracellular cytokine production, and analyzed by flow cytometry as described above. Neutralizing titers of polyclonal antiserum against either IFN-α or IL-12 p40/p70 (BioSource International) were added to cultures of PDCs and MDCs, respectively, at the time the TLR ligands were added. The DCs were thereafter used for T cell response experiments as described above. APCs were isolated from blood from HIV-1 seropositive individuals undergoing automated leukapheresis as described above and stimulated with TLR ligands for 12–24 h and exposed to a pool of HIV-1 15-mer peptides overlapping by 11 aa corresponding to sequences of HIV strain HXBc2 (122 gag peptides and 49 nef peptides) (20). The final concentration of any single peptide was 2 μg/106 cells in all experiments. Autologous T cells were then added to the APCs for an incubation of 6–8 h, and the cells were stained for intracellular cytokines as described above. As reported previously, human PDCs, MDCs, monocytes, and B cells have different expression patterns of TLR, and therefore exhibit unique responsiveness to individual TLR ligands accordingly (6, 7, 8, 9, 11, 12). Because phenotypic maturation of APCs, especially of DCs, is an important step in their functional capacity to activate T cells, we first characterized the phenotypic differentiation of isolated PDCs, MDCs, monocytes, and B cells after being exposed to different TLR ligands for 24 h.
Consistent with their expression of TLR9 and TLR7, PDCs differentiated in response to CpG ODN, imiquimod, and R-848, as shown by significant up-regulation of the costimulatory molecules CD40, CD80, CD86, and CD83, and MHC class II (HLA-DR) (Fig. 1⇓A). Along with the phenotypic differentiation of the PDCs, a notable increase in cluster formation of the cells in the cultures exposed to CpG ODN, imiquimod, or R-848 was observed without leading to plastic adherence of the cells (data not shown). PDCs stimulated with LPS, poly(I:C), or the control CpG ODN did not undergo any differentiation or morphological change compared with unstimulated PDCs. In contrast to PDCs, MDCs matured when stimulated with either LPS, R-848, or poly(I:C), correlating with their expression of TLR3, TLR4, and TLR7 (Fig. 1⇓B). The TLR ligand-activated MDCs increased in size and adhered more firmly to the plastic in the cell cultures (data not shown). Imiquimod induced minor, but notable, phenotypic changes in MDCs. Exposing the MDCs to higher concentrations of imiquimod did not increase this effect (data not shown). Consistent with their lack of TLR9 expression, MDCs did not respond to CpG ODN or the control CpG ODN. Monocytes and B cells expressed substantially lower baseline levels of costimulatory molecules compared with the subsets of matured DCs (Fig. 2⇓A). Neither B cells nor monocytes showed dramatic phenotypic differentiation when exposed to the indicated TLR ligands. Monocytes did show a small up-regulation of costimulatory molecules in response to LPS, and B cells showed a similar response to CpG ODN and R-848. However, when compared with the responses in DCs, these effects were minimal (Fig. 2⇓A). PDCs and MDCs differentiate in response to TLR ligation. Surface expression of various maturation markers (CD40, CD80, CD86, CD83, and MHC class II (HLA-DR)) after exposure of freshly isolated human DCs to TLR ligands. Phenotypic changes on PDCs (A) and MDCs (B) after exposure to the indicated TLR ligands were measured by flow cytometry. Data presented are overlaid histograms representing fluorescence intensity of cell surface molecules expressed on DCs after culture for 24 h with the indicated TLR ligands. A, PDCs and MDCs are more prone to undergo phenotypic differentiation, as measured by up-regulation of CD40, CD80, and CD86, after exposure to the indicated TLR ligands compared with monocytes and B cells. Data are presented as mean fluorescence intensity (MFI) values ± SEM as measured by flow cytometry analysis. (n ≥ 4; ∗, p ≤ 0.05 compared with the unstimulated cells.) B, Time course of maturation of PDCs and MDCs after TLR ligation. CD86 expression was evaluated by flow cytometry in PDCs after CpG ODN stimulation and MDCs after poly(I:C) stimulation. To determine the time frame for maturation of APCs caused by TLR ligands, a kinetic study was performed. The two subsets of DCs were stimulated for up to 72 h with the indicated TLR ligands, followed by phenotyping every 12 h. As shown in Fig. 2⇑B, the phenotypic maturation induced by the TLR ligands was found to occur very rapidly. By 12 h, significant maturation had already occurred in the stimulated DCs compared with matched unstimulated DCs or DCs stimulated with TLR ligands to which they were not susceptible (Fig. 2⇑B). The peak for maturation was found to occur between 24–36 h for both subsets of DCs in response to the various TLR ligands. After the DCs reached full maturation, an increase in the proportion of dead cells (20–40%) was noted in the cultures, despite the continued addition of the survival factors for PDCs and MDCs, IL-3, and GM-CSF, respectively. This led to an apparent decrease in the global level of maturation of the cells in the culture. In contrast, cultures of unstimulated DCs or DCs stimulated with TLR ligands for which they did not have cognate receptor for slowly matured over time, although never to the extent found in TLR ligand-differentiated DCs. Increasing the levels of IL-3 and GM-CSF did not lead to DC maturation to the extent found after addition of TLR ligands (data not shown). Cultures of unstimulated DCs or DCs stimulated with TLR ligands that did not cause differentiation did, however, show good cell viability (80–94%) at 72 h.
The subsets of DCs have been reported to have distinct patterns of cytokine production (11, 12). In this regard, PDCs may be the only APCs capable of producing IFN-α (3). Therefore, we investigated secretion of IFN-α and IL-12 p70, two potentially Th1-inducing cytokines, by different APCs in response to TLR ligation. PDCs produced high levels of IFN-α (5,000–10,000 pg/ml) in response to CpG ODN, imiquimod, or R-848 (n = 7, p ≤ 0.01 compared with unstimulated PDCs) (Fig. 3⇓A). IFN-α was not found in supernatants of unstimulated PDCs or PDCs treated with the control CpG ODN, LPS, or poly(I:C). IFN-α was not produced by MDCs, monocytes, or B cells exposed to any of the studied TLR ligands. Thus, these data confirm that IFN-α is induced only by TLR7 and TLR9 ligand-exposure of PDCs, which is consistent with their expression of such TLRs (4, 5, 6, 9, 11, 12). PDCs and MDCs have separate cytokine production profiles. IFN-α (A) and IL-12 p70 (B) production by APCs stimulated with the various TLR ligands. Supernatants were assessed by ELISA after 24 h. Data presented are mean levels ± SEM. High amounts of IL-12 p70 (10–2905 pg/ml) were produced by MDCs stimulated with either R-848, LPS, or poly(I:C) (n ≥ 6, p ≤ 0.01 compared with unstimulated MDCs) (Fig. 3⇑B). Imiquimod induced low but detectable levels of IL-12 (2.5–50 pg/ml, mean 18 pg/ml) in MDCs (n = 6, p ≤ 0.05 compared with unstimulated MDCs). In addition, low levels of IL-12 (0.3–34 pg/ml) production were produced from PDCs in response to the same TLR ligands that induced high levels of IFN-α (CpG ODN, imiquimod, R-848) (n ≥ 6, p ≤ 0.05 compared with unstimulated PDCs). Monocytes produced high levels of IL-12 (1–400 pg/ml, mean 126 pg/ml) (n = 6, p ≤ 0.05 compared with unstimulated monocytes) in response to LPS stimulation. B cells stimulated with R-848 induced detectable but much lower levels of IL-12 (0.5–6 pg/ml) (n = 6, p ≤ 0.05 to unstimulated B cells) compared with other APCs (Fig. 3⇑B). To determine whether the functional enhancement of APCs by TLR ligands could augment memory CMV-specific T cell function, we first evaluated the ability of enriched cultures of undifferentiated freshly isolated APCs to process and present CMV Ag, and subsequently activate CMV Ag-specific memory T cells. APCs isolated from CMV seropositive healthy donors were exposed to inactivated whole CMV Ags shortly before autologous memory T cells were added. The cocultures were subsequently analyzed by flow cytometry for activated cytokine expressing T cells. In initial experiments, the inactivated whole CMV preparation was found to induce both phenotypic differentiation of DCs and some IFN-α secretion in PDCs. The CMV preparation was further diluted to a concentration sufficient to activate CMV-specific T cells in the absence of DC phenotypic differentiation. Purified recombinant CMV pp65 protein failed to induce phenotypic maturation of DCs or IFN-α secretion in PDCs, but the dose required to activate significant CMV-specific T cell responses was high (>1 μg/ml) and occasionally turned out to be toxic for the APCs. Therefore, CMV pp65 protein was not used in further studies (data not shown). Addition of CMV Ags predominately induced CD4+ T cell responses, regardless of which APCs were used as stimulator cells. We and others have previously shown that the cytokine synthesis profile of CMV-and HIV-specific CD4+ T cells after short-term (6–8 h) ex vivo Ag-stimulation is dominated by production of Th1 cytokines such as IL-2, IFN-γ, and/or TNF-α (19, 20, 21, 22). Very few T cells respond with expression of the Th2 cytokine IL-4 with this experimental setting. To detect the majority of responding T cells, IL-2, IFN-γ, and TNF-α expression was detected using Abs to these cytokines labeled with the same fluorophore. Freshly isolated PDCs, MDCs, monocytes, and B cells pulsed with CMV Ags and cocultured with isolated T cells were all found to generate higher frequencies of responding CMV-specific CD4+ T cells (producing IL-2, IFN-γ, or TNF-α) compared with the frequencies of responding T cells found in CMV Ag-exposed unsorted bulk PBMC from the same donors (Fig. 4⇓ shows a representative example). Furthermore, MDCs consistently induced the highest frequency of cytokine-producing CD4+ T cells compared with the other subsets of APCs (Fig. 4⇓). PDCs were frequently found to be superior to monocytes and B cells in CMV-specific CD4+ T cell activation. The control supernatant for the CMV Ag preparation did not induce significant T cell response above the low spontaneous responses found in cell cultures in medium only. Different ratios of APC:T cells were tested (data not shown), and a ratio of 1 APC per 10 T cells was found to generate an optimal response, which was used in additional experiments. MDCs are superior to the other APCs in inducing activation of CMV-specific memory CD4+ T cells. The indicated APC populations isolated from a CMV+ donor were cocultured with sorted autologous T cells and stimulated with CMV Ags for 8 h. Responding CD4+ T cells as identified by production of IFN-γ, IL-2, and/or TNF-α expression were enumerated by flow cytometry. Unstimulated PBMCs (no addition of CMV) and stimulated unfractioned bulk PBMCs (CMV) were included as controls. The flow cytometric data represent gated CD3+CD4+ T cells. The effect that TLR ligand exposure of APCs has on the magnitude of virus-specific T cell responses was next investigated. Freshly isolated APCs from CMV seropositive donors were first exposed to inactivated whole CMV Ags and thereafter differentiated with TLR ligands before autologous memory T cells were added. The cocultures were subsequently analyzed for activated T cells expressing IFN-γ, IL-2, and TNF-α. MDCs and PDCs exposed to CMV Ags and appropriate TLR ligands enhanced the responsiveness of Ag-specific T cells compared with donor-matched unstimulated DCs or DCs stimulated with irrelevant TLR ligands. There was a significant augmentation in responding CMV-specific CD4+ T cells induced by PDCs stimulated with either CpG ODN, imiquimod or R-848 compared with unstimulated PDCs or PDCs stimulated with control CpG ODN, LPS, or poly(I:C) (n = 7, p ≤ 0.01) (Fig. 5⇓A). There were also significantly increased frequencies of responding CMV-specific CD4+ T cells activated by LPS-, poly(I:C)-, imiquimod-, and R-848-stimulated MDCs compared with MDCs exposed to CpG ODN. Despite the fact that imiquimod exposure only induced minor phenotypic maturation and moderate levels of IL-12 p70 in MDCs (Fig. 3⇑B), imiquimod treatment still enabled the MDCs to activate higher frequencies of CMV-specific CD4+ T cells compared with unstimulated MDCs. R-848 appeared to have the most potent effect on augmenting responses when summarizing the responses generated by both PDCs and MDCs (Fig. 5⇓, A and B). The same pattern of augmentation of CMV-specific CD4+ T cell responses using TLR ligand-modulated DCs was seen in CMV+ donors, regardless of the baseline magnitude of the CMV-specific responses (data not shown). TLR ligand-stimulation of APCs alone without addition of CMV Ag did not increase the T cell activation above the background seen in unstimulated cultures (data not shown). Both PDCs and MDCs cultured in the presence of the appropriate TLR ligands stimulate higher percentages of responding Ag-specific CD4+ T cells compared with monocytes and B cells. 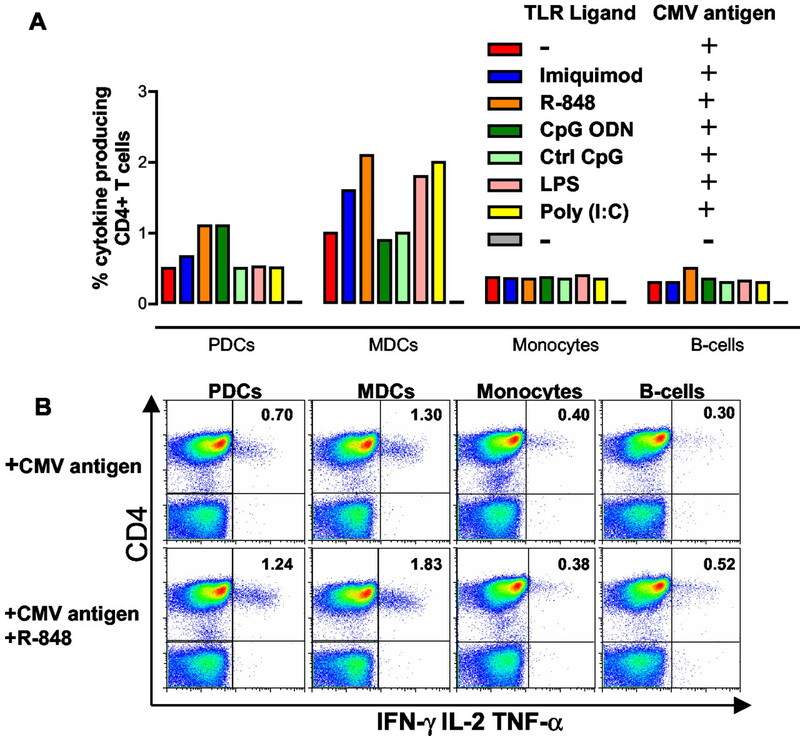 A, Bar graph shows frequencies of CMV-specific CD4+ T cells producing IFN-γ, IL-2, and/or TNF-α when activated by the APC subsets exposed to CMV Ags in addition to the indicated TLR ligands in one representative donor. B, The flow graphs illustrate cytokine production in responding CD3+ T cells stimulated by R-848-exposed and unexposed APCs from another donor. The displayed data in B represent gated CD3+ T cells. Because the CD8+ T cell responses to whole CMV Ags were poorly detected in most donors, we examined the efficiency of TLR ligand-stimulated APCs to activate CD8+ T cell responses to the HLA-A2 restricted CMV pp65 epitope (NLVPMVATV). APCs were isolated from HLA-A2+ CMV seropositive donors and stimulated with the indicated TLR ligands for 24–36 h. The APCs were exposed to the CMV-A2 peptide before the addition of autologous purified T cells. The APC-T cell cocultures were subsequently analyzed for stimulated CMV-specific CD8+ T cells. Unstimulated MDCs were superior to unstimulated PDCs, monocytes, and B cells for inducing cytokine production from CMV Ag-specific CD8+ T cells (Fig. 6⇓, A and B). 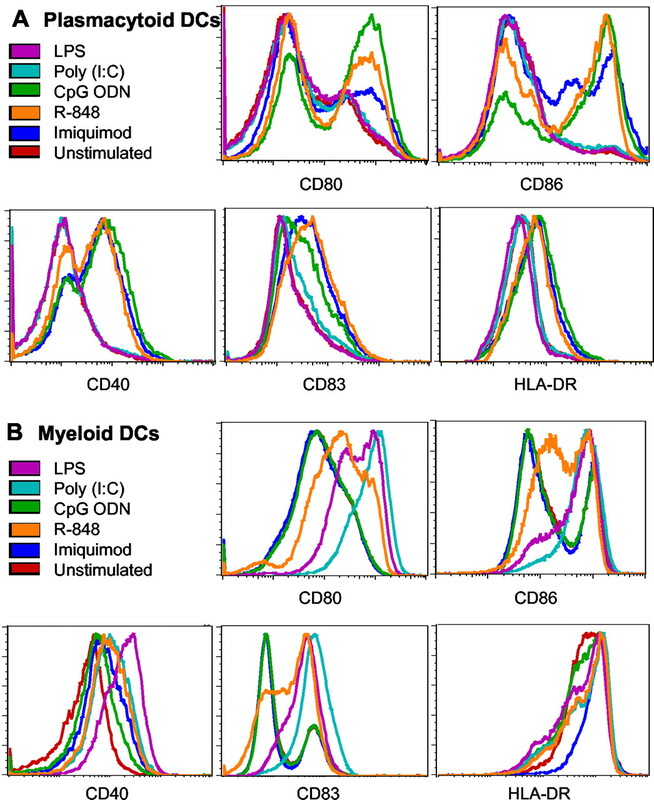 The ability of mature differentiated DCs to augment cytokine production by Ag-specific CD8+ T cells was demonstrated by the increase of responding CD8+ T cells when the DCs, either PDCs or MDCs, were exposed to the correct TLR ligands. CpG ODN-, imiquimod-, or R-848-stimulated PDCs or LPS-, poly(I:C)-, imiquimod-, or R-848-exposed MDCs consistently activated higher percentages of CMV-specific CD8+ T cells (n = 4, p ≤ 0.05) (Fig. 6⇓B). TLR ligand-stimulated monocytes (Fig. 6⇓, A and B) or B cells (Fig. 6⇓B) did not augment CMV-specific CD8+ T cell responses. Augmentation of CD8+ T cell responses is induced by optimally TLR ligand-stimulated DCs. Activation of CMV-specific CD8+ memory T cells, as assessed by TNF-α and/or IFN-γ expression, induced by the subsets of APCs presenting a CMV pp65 peptide in the presence of the described TLR ligands is demonstrated in a flow graph (A). The displayed data represent gated CD3+ T cells. The bar graph (B) shows an overview of the responses, depicted as the percentages of cytokine producing CD8+ T cells out of all CD8+ T cells, induced by the TLR ligand-stimulated APCs. C, The distribution of activated CD8+ T cells expressing either TNF-α, IFN-γ, or both cytokines simultaneously induced by the DCs is shown. D, The portion of cytokine-producing cells within the CMV-A2 peptide-specific CD8+ T cell population activated by the TLR ligand-stimulated DCs was examined by staining the cells with CMV-A2 tetramer+ CD8+ T cells after the activation period. The flow events shown in D are first defined on tetramer binding CD8+ T cells, then assessed for intracellular cytokine staining. The increases in responding CD8+ T cells found by TLR ligand-stimulated DCs were equally distributed among T cells producing IFN-γ, TNF-α, or both cytokines simultaneously (Fig. 6⇑C). To determine the percentages of all CMV-A2-specific CD8+ T cells induced to respond by the different DC-TLR ligand combinations, the responding CD8+ T cells were surface stained with CMV-A2 MHC class I tetramer, and the percentage of tetramer+ T cells that produced cytokines was determined (Fig. 6⇑D). Upon peptide stimulation, there was a significant down-regulation of TCR, CD3, and CD8 as a result of activation. The proportion of responding cytokine-expressing T cells within the CMV-A2 tetramer plus CD8+ T cell population increased when the DCs exposed to appropriate TLR ligands were used as stimulator cells (Fig. 6⇑D). The ability of TLR ligand-stimulated DCs to augment T cell responses was not changed when the DCs were cultured in the presence of neutralizing Abs to either IFN-α and IL-12 p70 in addition to TLR ligands (data not shown), indicating that enhanced cytokine secretion by DCs did not play a major role for activation of Ag-specific T cells in this system. To investigate the responses to another virus, we sorted blood APCs from HIV-1 seropositive individuals undergoing automated leukapheresis. All the HIV-1+ donors were on highly active anti-retroviral therapy; the HIV-1 viral loads and CD4 counts varied between <50 and 5000 viral RNA copies per milliliter plasma and 162–500 CD4+ cells per microliter blood, respectively. Although both subsets of DCs were isolated at lower frequencies from the HIV-1+ individuals compared with HIV-1 seronegative donors (in line with earlier observations, Refs. 23 and 24), the DCs showed a similar maturation pattern after being exposed to the appropriate TLR ligands (data not shown). The purified APCs were stimulated with the indicated TLR ligands for 24–36 h. A pool of overlapping peptides for the HIV-1 gag and nef genes was then added, followed by autologous purified T cells (20). PDCs and MDCs were superior to monocytes and B cells in inducing cytokine production from HIV-1-specific CD8+ T cells (Fig. 7⇓). Again, both subsets of DCs when stimulated with the appropriate TLR ligand amplified the numbers of cytokine producing Ag-specific CD8+ T cells. CpG ODN-, imiquimod- or R-848-stimulated PDCs, or poly(I:C)-, imiquimod- or R-848-exposed MDCs activated the highest frequencies of HIV-1-specific CD8+ T cells (n = 4, p ≤ 0.05). As seen for the CMV-specific responses, TLR ligand-stimulated monocytes or B cells did not augment HIV-specific CD8+ T cell responses (Fig. 7⇓). Frequencies of HIV-1-specific CD8+ memory T cells responding with cytokine (TNF-α and/or IFN-γ) production are enhanced when activated by subsets of DCs presenting HIV-1 gag and nef peptides in the presence of TLR ligands. Bar graph shows the responses, depicted as the percentages of cytokine producing CD8+ T cells out of all CD8+ T cells, induced by the indicated TLR ligand-stimulated APCs. In this study we assessed various TLR ligands for their immunostimulatory effects upon PDCs, MDCs, monocytes, and B cells, specifically addressing induction of maturation, cytokine production, and ability to augment CD4+ and CD8+ T cell responses ex vivo. Several prior reports have shown that APCs can respond to TLR ligands in accordance with their expression repertoire of TLRs (4, 5, 6, 9, 11, 12). To perform a comprehensive study comparing several TLR ligands side by side, we developed a system where large numbers of DCs were isolated from elutriated monocytes. We could thereby extend prior findings by showing that DCs optimally stimulated with appropriate TLR ligands can augment pre-existing anti-viral Ag-specific CD4+ and CD8+ memory T cell responses. PDCs, which express TLR7 and TLR9, stimulated with either CpG ODN, R-848, or imiquimod showed a dramatic and quick up-regulation of the costimulatory molecules CD40, CD80, and CD86, as well as CD83 and MHC class II (HLA-DR), and produced IFN-α. In accordance with their expression of TLR3, TLR4, and TLR7, MDCs were susceptible to poly(I:C), LPS, and R-848 (and imiquimod to a lesser degree), and responded with significant phenotypic differentiation and IL-12 p70 production. It has previously been demonstrated that R-848 is more potent than imiquimod in inducing up-regulation of costimulatory molecules and IL-12 production in both PDCs and MDCs (12). We also found that TLR ligand-induced activation of DCs greatly enhanced the ability of these cells to present virus Ag (CMV or HIV-1), resulting in increased frequencies of activated Ag-specific CD4+ and CD8+ T cells. This suggests that Ag-specific T cell immunity can be augmented through TLR ligand-modulated DCs. In this study, only activation of pre-existing Ag-specific T cells was studied. Ag-experienced T cells normally exist at a much higher frequency than Ag-inexperienced (naive) CD4+ T cells. A doubling of the frequency of responding memory T cells may have a substantial effect on the total effector cell response toward the particular virus. This is very different from priming of naive T cells, in which clonal expansion over several days is critical to generate a substantial effector response. Allogeneic CD4+ naive T cells have previously shown Th1 polarization in long term culture when R-848-stimulated human DCs were used as stimulator cells (12). Blocking the secretion of IFN-α and IL-12 p70 in those cultures showed substantial reduction of the Th1 polarization of naive T cells. In our study, blocking IFN-α and IL-12 did not change the degree of activation of Ag-specific memory T cells. These data suggest that phenotypic maturation involving up-regulation of costimulatory molecules on DCs, and not IFN-α or IL-12 secretion, plays the major role in activation of memory T cells over the short time period of the assay. This is supported by earlier studies showing that blocking of costimulatory molecules in this system significantly decreases that number of activated T cells (22). Furthermore, the very distinct cytokine production profiles (IFN-α vs IL-12) that PDCs and MDCs exhibit in response to the same TLR ligand (imiquimod and R-848) did not impact on their ability to stimulate Th1 effector cytokines by Ag-specific memory T cells. 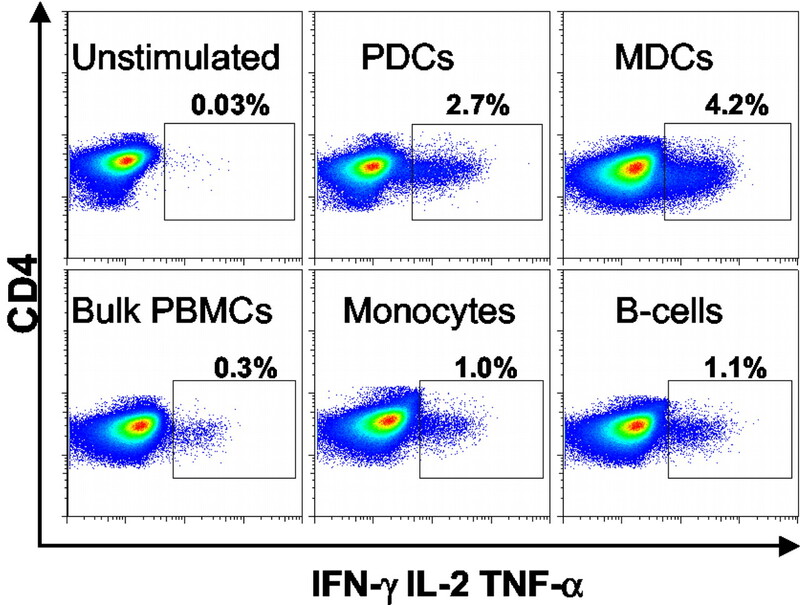 The small effect that cytokines secreted by APCs may have upon pre-existing Ag-specific T cells is also demonstrated by the fact that this assay can be performed on freshly purified PBMCs in the presence of the cytokine transport inhibitor brefeldin A throughout most or all of the culture time without affecting the activation of T cells (19, 20, 21, 22). However, as noted above, cytokine secretion may still play an essential role in the induction of naive T cell priming, which was not measured in this study. An effective prophylactic or therapeutic vaccination strategy against several virus and tumor Ags may require a strong Th1-inducing vaccine adjuvant. Although CFA is the strongest known Th1-inducing adjuvant, it causes severe granulomatous reactions at the injection site, and therefore is not approved for clinical use in humans (25). Aluminum hydroxide (alum) is currently the most frequently used vaccine adjuvant in humans, although it mainly induces humoral Th2 responses (26). Therefore, there is a need for new, safe, and efficient Th1-inducing vaccine adjuvants. The TLR9 ligand CpG ODN has shown enhancement of cellular immune responses when administered in conjunction with specific Ags in mice or monkeys (16, 27, 28, 29, 30). Distinct from the other TLR ligands are the synthetic low m.w. imidazoquinolines, imiquimod, and R-848 (resiquimod), recognized by TLR7 and TLR8. These compounds have also been demonstrated to function as immune response modifiers in animals, but do not resemble components of known pathogens (31, 32, 33). In a vaccine setting for human use, optimal stimulation of the broadest immune responses may occur after targeting several APCs, especially DCs. A careful selection of TLR ligands is therefore required. It remains possible that use of TLR ligands in animals may result in different responses than would be induced in humans. In this regard, there are important differences in the TLR expression pattern between mice and humans. TLR9 is not restricted to PDCs and TLR7 is not expressed on all subsets of DCs in mice (34, 35). TLR expression and analysis of DC subsets in monkeys are still poorly defined. Therefore, we performed ex vivo experiments on APCs freshly isolated from humans as a highly relevant experimental system for assessing the effects of TLR ligands on the human immune system. The majority of human DCs are of myeloid origin (blood CD11c+ MDCs and CD1a+ Langerhans cells in epidermal skin and subepithelial layers, as well as dermal DCs). This DC subset may be the primary APC in humans, and the most important to target with adjuvants in vaccination strategies. Although the recently identified PDC subset is more sparsely distributed in peripheral tissues, and its Ag presentation capability in humans is poorly understood, PDCs should still be considered for vaccine targeting (3). In this study, we found evidence that PDCs are indeed efficient APCs and activators of Ag-specific memory responses when cultured ex vivo. Freshly isolated mouse PDCs have been shown to lack the ability to induce naive T cell responses, but are good for stimulating pre-existing responses (36). PDCs may also be poorly phagocytic. By using peptides such as Ag for T cell activation, Ag processing is circumvented. Also, the irradiated whole CMV virus used in our experiments likely contains several TLR ligands within itself that can facilitate Ag uptake and presentation by PDCs. Nevertheless, PDCs produce IFN-α and perhaps other factors that may create a milieu that activates and matures MDCs. Monocytes and B cells, despite their expression of TLRs, showed less phenotypic differentiation in response to TLR ligands compared with either subset of DCs. However, monocytes and B cells may exhibit alternative kinetics when responding to this class of vaccine adjuvants. Additionally, cytokines other than IL-12 and IFN-α were not measured in this study. Monocytes are known to produce pro-inflammatory responses by TLR ligation. B cells express TLR9 and can respond to some types of CpG ODNs with proliferation and Ab production (15). Therefore, we cannot absolutely rule out other important TLR ligand-induced effects upon these APC populations. Despite that PDCs were found to be potent T cell stimulators in our study, MDCs were superior to all other APCs in their ability to activate virus Ag-specific T cells. This was most pronounced for activation of CD4+ T cells generated after processing and presentation of whole CMV Ags by MDCs. MDCs may be more efficient in Ag uptake and processing than other APCs. They also have a higher baseline expression of MHC class II and costimulatory molecules. Several studies have demonstrated that DCs of myeloid origin have an extraordinary potential to stimulate T cells compared with other APCs (2, 37). Antigenic peptides from the same protein may be differentially presented by MDCs compared with other APCs (38, 39). It remains to be elucidated whether the increase of responding Ag-specific T cells caused by TLR ligand-stimulated DCs consisted of activation of T cells specific for subdominant epitopes with a higher threshold for activation, and thereby leading to a broader immune response. As an aside to our findings, it is clear that peptide stimulation of PBMCs followed by intracellular cytokine staining may significantly underestimate the true frequency of memory CD4+ and CD8+ T cells capable of responding. In conclusion, both CMV-and HIV-1-specific T cell responses can be augmented when DCs present Ags after stimulation with the appropriate TLR ligands. This provides important information for the rational design of new vaccine adjuvants and immune modulating therapy. ↵1 K.L. is supported with a postdoctoral scholarship from The Swedish Foundation for International Cooperation in Research and Higher Education. ↵3 Abbreviations used in this paper: TLR, Toll-like receptor; DC, dendritic cell; PDC, plasmacytoid DC; MDC, myeloid DC; ODN, oligodeoxynucleotide. Colonna, M., A. Krug, M. Cella. 2002. Interferon-producing cells: on the front line in immune responses against pathogens. Curr. Opin. Immunol. 14:373. Kadowaki, N., S. Ho, S. Antonenko, R. W. Malefyt, R. A. Kastelein, F. Bazan, Y. J. Liu. 2001. Subsets of human dendritic cell precursors express different Toll-like receptors and respond to different microbial antigens. J. Exp. Med. 194:863. Jarrossay, D., G. Napolitani, M. Colonna, F. Sallusto, A. Lanzavecchia. 2001. Specialization and complementarity in microbial molecule recognition by human myeloid and plasmacytoid dendritic cells. Eur. J. Immunol. 31:3388. Hornung, V., S. Rothenfusser, S. Britsch, A. Krug, B. Jahrsdorfer, T. Giese, S. Endres, G. Hartmann. 2002. Quantitative expression of Toll-like receptor 1–10 mRNA in cellular subsets of human peripheral blood mononuclear cells and sensitivity to CpG oligodeoxynucleotides. J. Immunol. 168:4531. Krug, A., A. Towarowski, S. Britsch, S. Rothenfusser, V. Hornung, R. Bals, T. Giese, H. Engelmann, S. Endres, A. M. Krieg, G. Hartmann. 2001. Toll-like receptor expression reveals CpG DNA as a unique microbial stimulus for plasmacytoid dendritic cells which synergizes with CD40 ligand to induce high amounts of IL-12. Eur. J. Immunol. 31:3026. Bauer, M., V. Redecke, J. W. Ellwart, B. Scherer, J. P. Kremer, H. Wagner, G. B. Lipford. 2001. Bacterial CpG-DNA triggers activation and maturation of human CD11c − CD123+ dendritic cells. J. Immunol. 166:5000. Ito, T., R. Amakawa, T. Kaisho, H. Hemmi, K. Tajima, K. Uehira, Y. Ozaki, H. Tomizawa, S. Akira, S. Fukuhara. 2002. 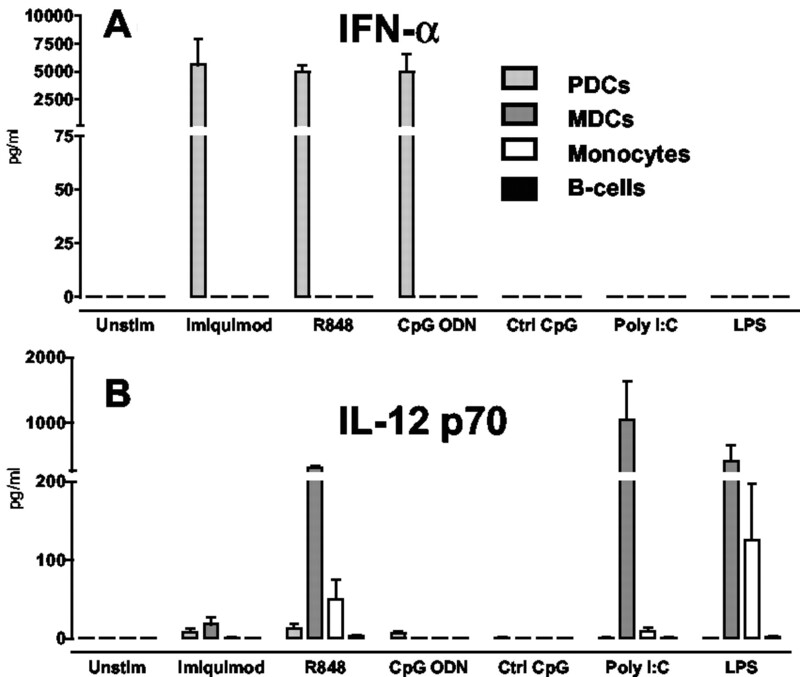 Interferon-α and interleukin-12 are induced differentially by Toll-like receptor 7 ligands in human blood dendritic cell subsets. J. Exp. Med. 195:1507. Jurk, M., F. Heil, J. Vollmer, C. Schetter, A. M. Krieg, H. Wagner, G. Lipford, S. Bauer. 2002. Human TLR7 or TLR8 independently confer responsiveness to the antiviral compound R-848. Nat. Immunol. 3:499. Krug, A., S. Rothenfusser, V. Hornung, B. Jahrsdorfer, S. Blackwell, Z. K. Ballas, S. Endres, A. M. Krieg, G. Hartmann. 2001. Identification of CpG oligonucleotide sequences with high induction of IFN-α/β in plasmacytoid dendritic cells. Eur. J. Immunol. 31:2154. Verthelyi, D., R. T. Kenney, R. A. Seder, A. A. Gam, B. Friedag, D. M. Klinman. 2002. CpG oligodeoxynucleotides as vaccine adjuvants in primates. J. Immunol. 168:1659. Hartmann, G., J. Battiany, H. Poeck, M. Wagner, M. Kerkmann, N. Lubenow, S. Rothenfusser, S. Endres. 2003. Rational design of new CpG oligonucleotides that combine B cell activation with high IFN-α induction in plasmacytoid dendritic cells. Eur. J. Immunol. 33:1633. De Rosa, S. C., J. M. Brenchley, M. Roederer. 2003. Beyond six colors: a new era in flow cytometry. Nat. Med. 9:112. Betts, M. R., J. P. Casazza, B. A. Patterson, S. Waldrop, W. Trigona, T. M. Fu, F. Kern, L. J. Picker, R. A. Koup. 2000. Putative immunodominant human immunodeficiency virus-specific CD8+ T-cell responses cannot be predicted by major histocompatibility complex class I haplotype. J. Virol. 74:9144. Betts, M. R., D. R. Ambrozak, D. C. Douek, S. Bonhoeffer, J. M. Brenchley, J. P. Casazza, R. A. Koup, L. J. Picker. 2001. Analysis of total human immunodeficiency virus (HIV)-specific CD4+ and CD8+ T-cell responses: relationship to viral load in untreated HIV infection. J. Virol. 75:11983. Pitcher, C. J., C. Quittner, D. M. Peterson, M. Connors, R. A. Koup, V. C. Maino, L. J. Picker. 1999. HIV-1-specific CD4+ T cells are detectable in most individuals with active HIV-1 infection, but decline with prolonged viral suppression. Nat. Med. 5:518. Waldrop, S. L., C. J. Pitcher, D. M. Peterson, V. C. Maino, L. J. Picker. 1997. Determination of antigen-specific memory/effector CD4+ T cell frequencies by flow cytometry: evidence for a novel, antigen-specific homeostatic mechanism in HIV-associated immunodeficiency. J. Clin. Invest. 99:1739. Grassi, F., A. Hosmalin, D. McIlroy, V. Calvez, P. Debre, B. Autran. 1999. 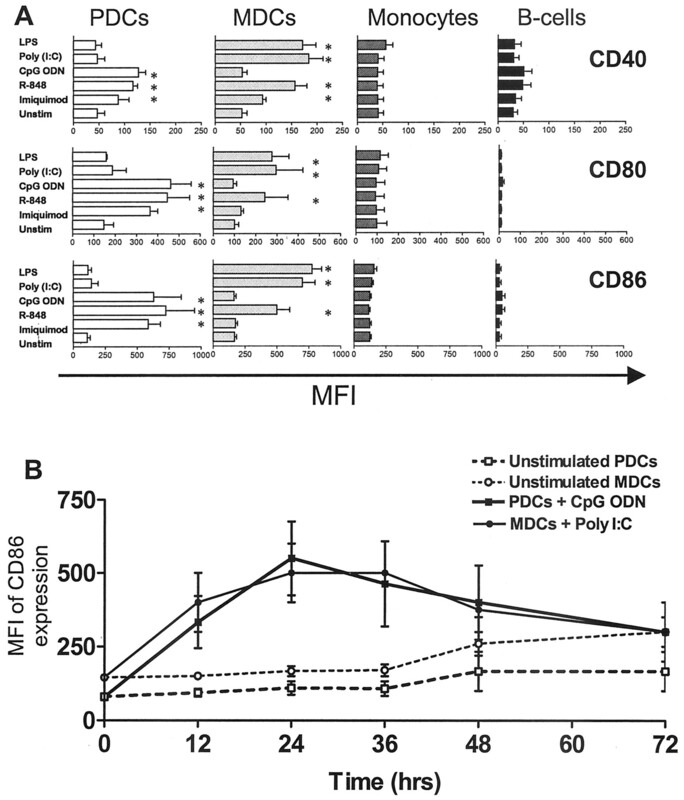 Depletion in blood CD11c-positive dendritic cells from HIV-infected patients. AIDS 13:759. Pacanowski, J., S. Kahi, M. Baillet, P. Lebon, C. Deveau, C. Goujard, L. Meyer, E. Oksenhendler, M. Sinet, A. Hosmalin. 2001. Reduced blood CD123+ (lymphoid) and CD11c+ (myeloid) dendritic cell numbers in primary HIV-1 infection. Blood 98:3016. Bomford, R.. 1980. The comparative selectivity of adjuvants for humoral and cell-mediated immunity. II. Effect on delayed-type hypersensitivity in the mouse and guinea pig, and cell-mediated immunity to tumour antigens in the mouse of Freund’s incomplete and complete adjuvants, alhydrogel, Corynebacterium parvum, 1 Bordetella pertussis, muramyl dipeptide and saponin. Clin. Exp. Immunol. 39:435. Cox, F. E., F. Y. Liew. 1992. T-cell subsets and cytokines in parasitic infections. Immunol. Today 13:445. Weiner, G. J., H. M. Liu, J. E. Wooldridge, C. E. Dahle, A. M. Krieg. 1997. Immunostimulatory oligodeoxynucleotides containing the CpG motif are effective as immune adjuvants in tumor antigen immunization. Proc. Natl. Acad. Sci. USA 94:10833. Oxenius, A., M. M. Martinic, H. Hengartner, P. Klenerman. 1999. CpG-containing oligonucleotides are efficient adjuvants for induction of protective antiviral immune responses with T-cell peptide vaccines. J. Virol. 73:4120. Deml, L., R. Schirmbeck, J. Reimann, H. Wolf, R. Wagner. 1999. Immunostimulatory CpG motifs trigger a T helper-1 immune response to human immunodeficiency virus type-1 (HIV-1) gp 160 envelope proteins. Clin. Chem. Lab Med. 37:199. Ballas, Z. K., A. M. Krieg, T. Warren, W. Rasmussen, H. L. Davis, M. Waldschmidt, G. J. Weiner. 2001. Divergent therapeutic and immunologic effects of oligodeoxynucleotides with distinct CpG motifs. J. Immunol. 167:4878. Bernstein, D. I., R. L. Miller, C. J. Harrison. 1993. Adjuvant effects of imiquimod on a herpes simplex virus type 2 glycoprotein vaccine in guinea pigs. J. Infect. Dis. 167:731. Wagner, T. L., C. L. Ahonen, A. M. Couture, S. J. Gibson, R. L. Miller, R. M. Smith, M. J. Reiter, J. P. Vasilakos, M. A. Tomai. 1999. Modulation of TH1 and TH2 cytokine production with the immune response modifiers, R-848 and imiquimod. Cell. Immunol. 191:10. Vasilakos, J. P., R. M. Smith, S. J. Gibson, J. M. Lindh, L. K. Pederson, M. J. Reiter, M. H. Smith, M. A. Tomai. 2000. Adjuvant activities of immune response modifier R-848: comparison with CpG ODN. Cell. Immunol. 204:64. Edwards, A. D., S. S. Diebold, E. M. Slack, H. Tomizawa, H. Hemmi, T. Kaisho, S. Akira, C. Reis e Sousa. 2003. Toll-like receptor expression in murine DC subsets: lack of TLR7 expression by CD8a+ DC correlates with unresponsiveness to imidazoquinolines. Eur. J. Immunol. 33:827. Krug, A., R. Veeraswamy, A. Pekosz, O. Kanagawa, E. R. Unanue, M. Colonna, M. Cella. 2003. Interferon-producing cells fail to induce proliferation of naive T cells but can promote expansion and T helper 1 differentiation of antigen-experienced unpolarized T cells. J. Exp. Med. 197:899. Larsson, M., J. F. Fonteneau, M. Lirvall, P. Haslett, J. D. Lifson, N. Bhardwaj. 2002. Activation of HIV-1 specific CD4 and CD8 T cells by human dendritic cells: roles for cross-presentation and non-infectious HIV-1 virus. AIDS 16:1319. Butz, E. A., M. J. Bevan. 1998. Differential presentation of the same MHC class I epitopes by fibroblasts and dendritic cells. J. Immunol. 160:2139. Gapin, L., Y. Bravo de Alba, A. Casrouge, J. P. Cabaniols, P. Kourilsky, J. Kanellopoulos. 1998. Antigen presentation by dendritic cells focuses T cell responses against immunodominant peptides: studies in the hen egg-white lysozyme (HEL) model. J. Immunol. 160:1555.